As spring approaches, Philadelphia is given a new life from the blooming flowers, rising temperatures, and longer days. Our favorite part of spring? Outdoor dining finally reopens for the warm weather season. 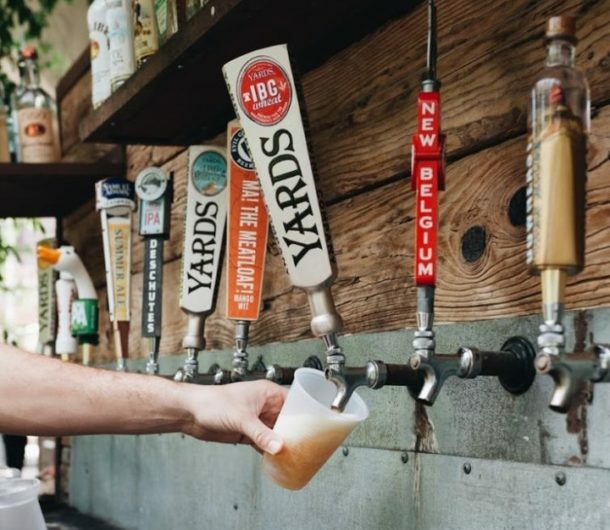 Cheers to the end of winter and the exciting promise of the warmer days to come at some of our favorite outdoor bars in Philadelphia. Enjoy a handcrafted experience at popular local hangout City Tap House in University City. Enjoy one of the largest selections of craft beer in Philadelphia and a range of delicious American fare including their famous brick-oven pizzas. When the weather permits, take your brews out on their spacious patio. A lush oasis in the heart of Center City, Independence Beer Garden is the perfect place to enjoy craft brews in the fresh Philadelphia air. Filled to the brim with beautiful greenery, this outdoor space offers visitors a selection of 40 taps and delicious American-style eats in a rustic-chic atmosphere. The only restaurant in Old City with a roof deck, Revolution House is local favorite after-hours spot. Enjoy an extensive beer, wine, and specialty cocktail list while you chow down on a delectable American-inspired menu. Take your drinks to the roof deck and cheers to the weekend while looking out on Market Street. Sip and savor from high above the Old City streets at Straus Rooftop Lounge. The open-air hotspot offers a cocktail-forward drink menu and a globally-inspired selection of small plates. Enjoy stunning views of the city from the outdoor terrace and private pavilions. The perfect spot for casual post-work drinks, Talula’s Garden showcases an ambient, laidback vibe with fresh, farm-to-table cuisine. This secret garden is tucked away in Center City and offers a wide beer and wine selection, ideal for enjoying Philadelphia’s spring weather. Nothing goes with warm weather quiet like margaritas. Take happy hour south of the border at the hip East Passyunk restaurant, Cantina Los Caballitos. This popular hangout offers some of the best margarita deals in the city, as well as a wide selection of tequila and mezcal drinks.